We caught up (but there is probably a new one tonight). The episode with Rosa coming out as bi to her parents was really sad. It was nice her dad was willing to keep his relationship with his daughter but the mom needed more time. Then it was so sweet/sad when Jake and everyone went over there for game night. I like a comedy that can sneak in a heart felt moment and make you feel. The episode after that was described to me by Wilkins as one of the funniest episodes of B99 ever. The doofus crime family brother was really funny. "Why do you have so many lamps"
"I ordered 100 instead of 1. I only had 6 months to return them...you get it"
Tyler wrote: Source of the post We caught up (but there is probably a new one tonight). I don't know why, but this episode just had my number. I loved it. Was happy to see this show was back. Last night's episode was great as always. I am surprised they wrapped up that plot so easily. "They got (what's his name) and his entire operation". Wow, that was easy! Tyler wrote: Source of the post Was happy to see this show was back. Last night's episode was great as always. I am surprised they wrapped up that plot so easily. I liked this episode a lot. Holt and his husband make the best episodes. Werd. I like seeing two guys play the extreme straight man (no opposite of pun intended) in a comedy. The way they talk to each other is very entertaining. "He didn't say please excuse me. He might as well have spit in my face"
Pontiac bandit returns! Lol at the joke at seeing each other once per year. You knew he wasn't going to completely screw over Jake or he would have been kicked off the force for sure, he still probably should have been even after getting the diamonds back. Tyler wrote: Pontiac bandit returns! Lol at the joke at seeing each other once per year. You knew he wasn't going to completely screw over Jake or he would have been kicked off the force for sure, he still probably should have been even after getting the diamonds back. I really liked the bottle episode or just Jake and Holt interrogating that guy. 2) No one has ever waited until the week of a wedding to do those things. Will agree. Maybe some tasks, but not THOSE tasks. This latest episode could have easily been a series finale. cwilkins88 wrote: This latest episode could have easily been a series finale. Yeah it could have. Very nice episode, but none of their families came to the wedding?! Wut? 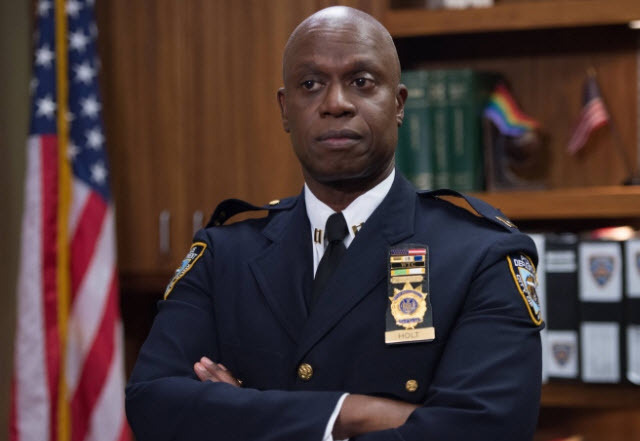 I shed a single tear when Holt said he loved them. Lol at Gina's white dress.